SoftPlanet makes it possible for everyone to get free YUMI download directly from our servers. There is no registration needed for downloading. YUMI 0.1.1.0 is another portable program that is capable of installing one or more Linux distributions on your USB flash drive. Besides that you can add antivirus tools, system utilities and other operating system programs. To process bootable ISO files is another thing that you can do with YUMI. By the way, this stands for Your Universal Multiboot Installer. The fact that it is very simple to use does not mean that it can be used by anyone because there are things that require advanced knowledge from the users. YUMI does not have too many features because this is not the case here. You can select your USB drive from the drop-down menu and once that is done – several checkbox options appear to the right. They refer to the selected drive and you can use any one of them if you know what they do. In fact all listed distributions can be selected and if you cannot find the one you need – simply click on the link that will guide you to the developer's website. There you can choose the version that you need and it will be downloaded to your PC prior to being used. YUMI has a very simple user interface and this is primarily because it does several things only. Formatting any USB drive prior to using it is possible by activating a checkbox to the right. Once you select what program version you want to be distributed to the USB flash drive the program automatically starts to do everything itself. 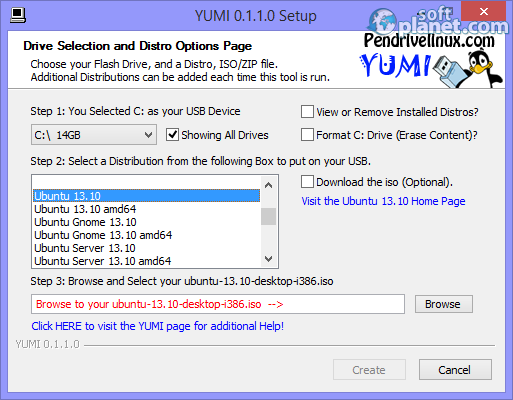 YUMI works pretty much like Universal USB Installer, except that it can be used to install more than one distribution to one USB flash drive. If you want, you can use the program to uninstall any of the previously installed Linux versions too. Besides Linux distributions, YUMI can be used to add antivirus utilities such as AVG Rescue CD, system utilities, e.g. System Rescue CD and other OS programs like Windows 7/8 installers. Processing ISO bootable files is also possible because your USB flash drive is a bootable device in general. Saving time and money today is one of the most common things for all of us. YUMI 0.1.1.0 is a comprehensive tool that can do that for you without too much effort and it will not use a lot of your system resources. We did not encounter any problems while we were testing it and this is a big program plus that we can mention here. If you have intentions to create multi-boot and multi-system USB flash drives – stop looking for another program because you have already found it. Our security scan shows that YUMI is clean from viruses. The current version of YUMI has been scanned by our system, which contains 46 different anti-virus algorithms. That ensures that YUMI 0.1.1.0 is 100% safe for your computer.